If you want to know how to cook filet mignon, it is best to understand what this is. Filet mignon is the “French” term for this cut of beef. Although we quite often use this term here in the United States, we also refer to it as a beef fillet or beef tenderloin steak. Some of us just call it the “best melt in your mouth steak”! This cut of beef is also very popular in many countries of the world with a variety of names. In Britain you might hear “medallion”, Ireland, a “fillet”, Australia and New Zealand, “eye fillet”. Whatever it is called, all who like beef can tell you what this cut is, what part of the beef it comes from and why they think it is so tasty. To learn more about how to cook filet mignon, let us look at what part of the beef from which it is cut. This will help you to understand how important the cooking method is. This steak is cut from the long slender tenderloin muscle of the beef. It is positioned along the backbone and under the ribs therefore receiving less work. While we often think of “muscles” of an animal as being tough, this location is what makes it so tender, flavorful and with very little fat. When learning how to cook filet mignon, you might like to cut your own from a whole tenderloin. Steak filets are cut across the grain of the tenderloin which also adds to the good texture and tenderness. Fast dry cooking is the method to use on these steaks. One of my favorite ways is to place them on a hot barbeque grill. A little salt and pepper for seasoning is all that is needed. Cook a few minutes on each side and you have the most delicious steak imaginable. Inside, the hot oven broiler is a great way for cooking filets. 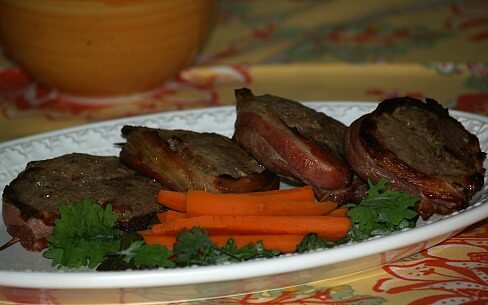 As you are learning how to cook filet mignon, you will also want to try stove top cooking. A hot skillet is good for quickly searing in the juices. Add a little fat to the skillet over heat and when hot put in the steaks. Again, only a few minutes on each side. Although the whole tenderloin can be roasted in the oven, oven roasting is not usually used for filets. It is too slow, allowing for the evaporation of the juices thus making the steak tough and dry. If you want to know how to cook filet, this beef wellington recipe is very popular and delicious. Place tenderloins in freezer for 20 minutes; brush with oil and sprinkle with salt/ pepper. Brown in skillet for 5 minutes on each side; chill. Combine ground steak, salt, pepper, garlic and parsley; mix well, divide into 8 parts and place on each tenderloin. Roll out each thawed patty shell to 5 X 9 inches 1/8 inch thick. 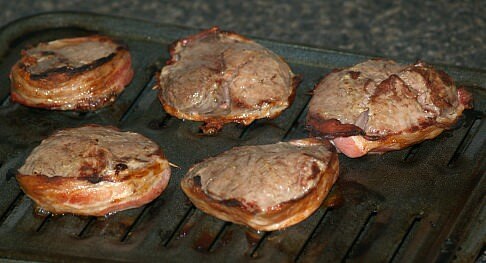 Place each tenderloin fillet on each shell, sirloin down and ground steak up. 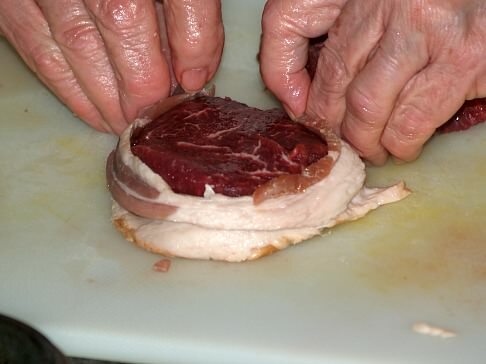 Wrap sides up over the fillet and place on lightly greased baking sheet with seam side down. Brush pastry with egg white and bake 10 minutes for rare, 12 minutes for medium rare, 15 minutes for medium. Rub steaks gently with salt/pepper; brush with steak sauce. 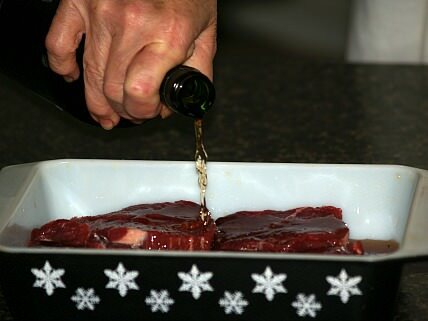 Place steaks in bottom of glass baking dish; pour in red wine to coat steaks (lift steaks up to make sure they are coated with wine). Cover and chill for 30 minutes; broil or grill to desired doneness and serve with tomato cream sauce recipe. Sauté garlic, onion, parsley and Italian seasoning in hot oil until light brown; stir in tomatoes and ketchup. Cook until liquid is reduced ½; stir in sour cream. Blend mixture in a blender until creamy; add more milk if desired. 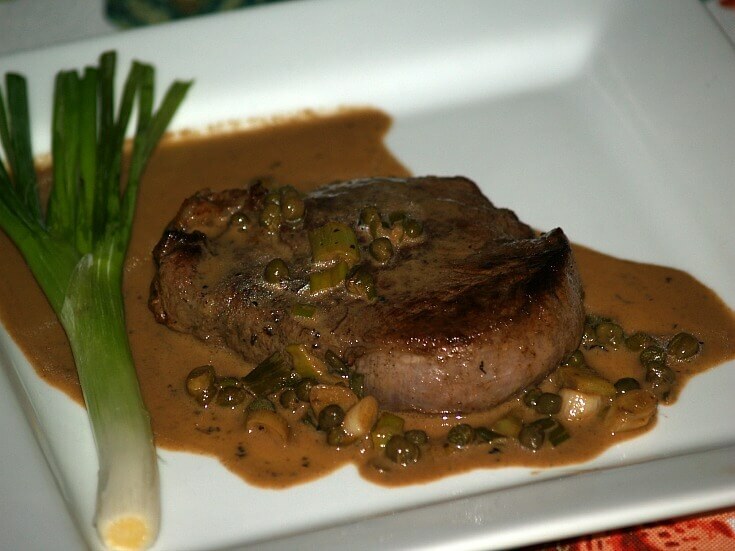 This mustard capers recipe goes well with any beef tenderloin recipe but is lovely when learning how to cook filet mignon. Cook steaks in melted butter in a large skillet over medium high heat 4 to 6 minutes on each side or until desired degree of doneness; remove from skillet and keep warm. Add vermouth; cook over high heat deglazing the skillet by scraping particles that cling to the bottom. Add green onion, water, whipping cream, capers, mustard, salt, pepper and bouillon cube. Bring mixture just to a boil, reduce heat and simmer 5 minutes or until mixture is reduced to about 1 cup. When you learn how to cook filet mignon recipes you will also know how to cook beef tenderloin. Melt 4 Tablespoons butter in large skillet. Saute shallots, mushrooms and thyme until vegetables are tender. Melt 2 tablespoons butter in another large skillet or pan; add spinach. Cover and cook spinach until hot and wilted; set off and keep warm. Remove vegetables from first skillet to a plate; brown steaks on both sides to desired doneness. Top each steak fillet with brie slice and a portion of the spinach. Lift fillets onto a platter with spatula; keep warm. Add the vegetables back into skillet; add wine and beef broth. Stir and boil about 5 minutes scraping bottom of skillet. Place finished steaks on dinner plates; serve glaze with steaks. Learn how to cook filet mignon with Jack Daniels. Coat steaks with pepper on one side; press firmly into the meat to adhere. Turn steaks over and repeat with pepper. Coat large heavy skillet with olive oil; heat until it starts to smoke. Sear steaks on both sides; remove from skillet and place steaks on broiler pan. Remove skillet from heat and add Jack Daniels; cook alcohol until reduced by half. NOTE: Alcohol in the Jack Daniels will flame if using a gas stove. Add demi glaze and cook over medium heat to a thick sauce consistency. While sauce cooks, place onion slices on top of steaks; broil steaks until desired doneness. 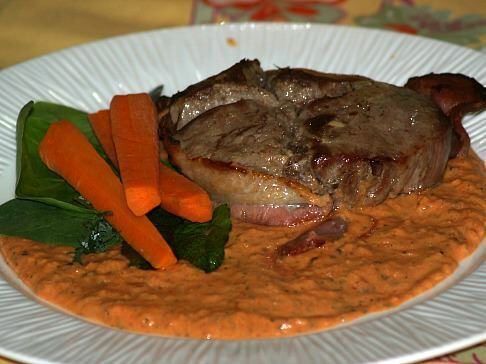 When sauce is ready stir in butter; place sauce on warm plate and place steak on top. NOTE: You can dribble a little sauce over top for garnish. Rub tenderloin steaks evenly with salt and pepper. Heat oil in large ovenproof skillet over high; cook steaks 2 to 3 minutes on each side. Place in hot oven about 8 minutes until desired doneness; serve with balsamic sauce. Combine wine, sherry, vinegar, shallot and garlic in small saucepan. Bring mixture to a boil and cook 2 minutes; cool mixture. Whisk egg yolks into wine mixture; cook over low whisking constantly until thickened. Slowly whisk in butter until blended; serve immediately. 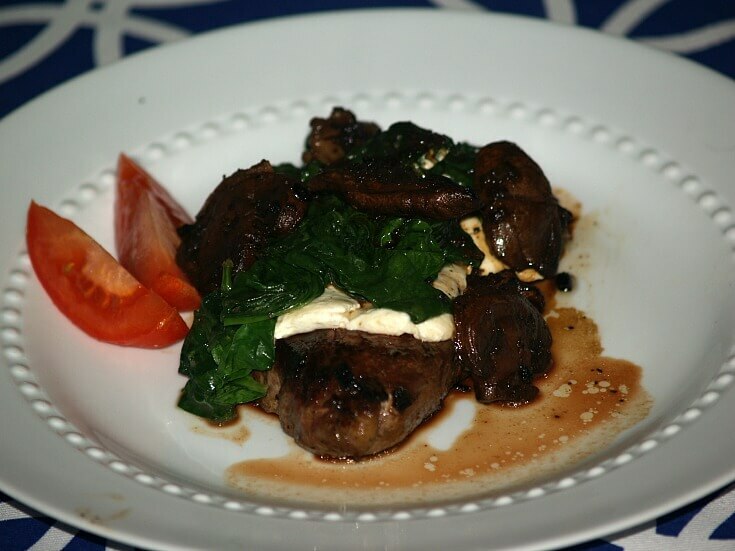 Learn how to cook filet mignon with Gorgonzola cheese. Heat olive oil in a large skillet; add steaks and cook over medium high heat to desired doneness. 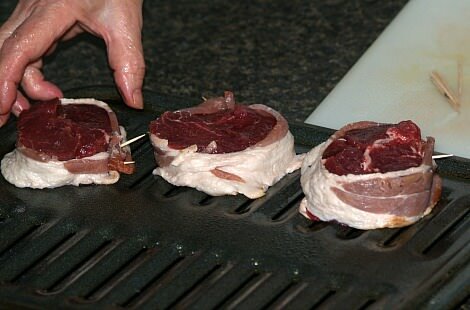 Remove steaks from skillet to a large warm platter’ keep warm. Add butter and shallots to skillet; cook stirring constantly until shallots are tender. Add brandy and cheese to skillet; stir constantly until cheese melts. Add beef broth, salt and pepper and bring to a boil. Reduce heat and simmer uncovered until slightly thickened about 45 minutes. Return steaks to the skillet; cook over low heat until thoroughly heated. Combine beef broth, wine, flour, dry mustard, salt and pepper; blend until smooth and set aside. Heat 1 ½ tablespoons olive oil in large skillet over medium high heat. Cook and stir shallot and mushrooms in hot skillet for 2 minutes. Gradually add broth mixture stirring until smooth; bring to a boil. 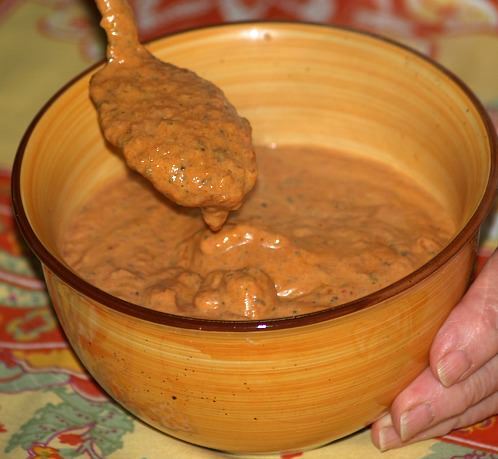 REDUCE HEAT and simmer for 18 minutes or until sauce is reduced by one third. Add lingonberries to mixture and stir to blend. Cook steaks in remaining 1 ½ tablespoons olive oil about 4 minutes on each side or until desired doneness. Serve sauce with steaks; serves 6.